The resale shop is moving into the Reebie Storage Warehouse building by mid-August. LINCOLN PARK — The historic Reebie Storage Warehouse soon will be full of vintage treasures. 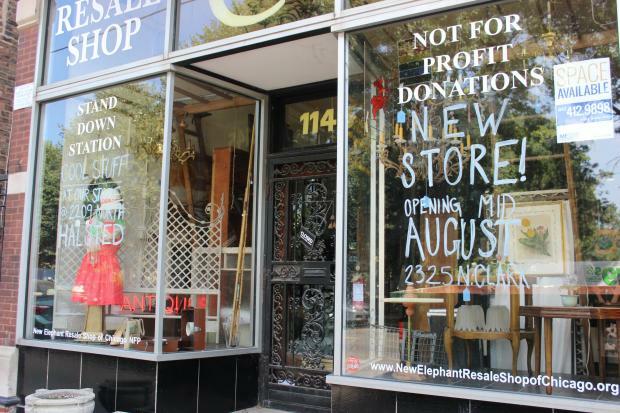 The folks behind the New Elephant resale shop are planning to consolidate both of their Lincoln Park locations and move into the ornate Reebie Storage Warehouse building at 2325 N. Clark St. by mid-August. One of the locations at 1145 W. Webster Ave. recently closed, while the other at 2209 N. Halsted St. will stay open for the next four-six weeks before the owners pack up and move everything into the historic building, according to a Facebook post and a sign on the window. The nonprofit sells vintage and antique furniture, home goods and clothing — all benefiting three local charities: Jesse White Tumbling Team, Rotary Club One and Boys Hope Girls Hope of Illinois, according to its website. The owners couldn't be immediately reached for comment. Built in 1922 for the Reebie Storage and Moving Co., the Reebie Storage Warehouse building is on the National Register of Historic Places for its unique Egyptian revival architectural style.